Even though current treatment for paediatric NHL results in excellent outcomes for most children, the burden of therapy and associated morbidities are still significant. In addition, patients with relapsed or refractory disease still have a dismal prognosis with less than 30% of patients achieving a long-term cure. Further intensification of chemotherapy is unlikely to increase cure rates. Novel and targeted therapies that are effective in curing relapsed patients and potentially reduce toxicities in newly diagnosed patients whilst preserving their excellent outcomes are needed. 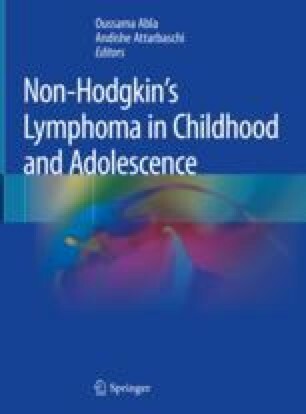 Numerous novel agents approved or in clinical trials for adult NHL are of potential interest for paediatric NHL and will be discussed in this chapter. In addition, the current status of immunotherapy with a focus on chimeric antigen receptor (CAR) and tumour-associated antigen (TAA) T-cells will be reviewed.